Pinterest advertising is the quiet achiever of social media marketing and we haven’t even begun to scratch the surface. We think of Pinterest as beautifully structured digital image boards, a place you might go to find a new recipe or room decor idea, but there is far more potential to this social platform than virtual scrapbooking. Pinterest is an action-focused arena for users to find lifestyle centric content and curate their own “boards” of interests sets. Content can be “pinned” from anywhere on the web with personal annotations, retaining the data from the original source, allowing users to easily navigate back to where it was found. As a platform, Pinterest is searchable allowing you to source content from the “Pins” of other users, creating a giant bank of content across every imaginable topic including recipes, DIY ideas, fashion inspiration, travel ideas, gift ideas and many more. And with a global user count which exceeds 180 million, Pinterest has definitely made its mark. Naysayers who draw a quick comparison to Facebook’s 2 billion users may dismiss Pinterest as a small player in the market, however, there are key factors at play which prove that Pinterest is significantly powerful in driving traffic and online sales. The Pinterest feed algorithm is part of its inherent beauty. Unlike the Facebook feed, it does not diminish the presence of organic, brand content amongst user-generated content. Women are five times more likely to use Pinterest than men, with 15X more pins by women than by men. The vast majority of Pinterest users hold a Bachelor’s Degree or higher. Two-thirds of the content saved by Pinterest users come from businesses. 87% of Pinterest users have purchased a product because of Pinterest. According to research from Ahalogy, Pinterest users are eager to connect with brands. 73% would rather follow a brand than an influencer. 93% of active users said they use Pinterest to plan for purchases. Every day, around 2 million product-related pins are saved by users. Over 2 billion searches occur on Pinterest every month. Unlike the “friends and family-first” mantra apparent on Facebook, Pinterest encourages businesses and advertisers to supply useful content to its users, with the intention of helping them fulfil and action. These attributes make Pinterest the perfect playground for promoting your online store’s products. 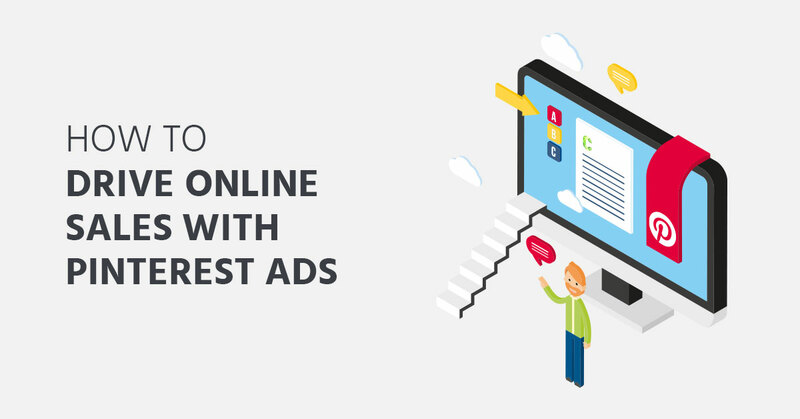 Now you know that Pinterest users are keen to discover your products, it’s time to dig deeper into the effectiveness and benefits of Pinterest ads. This is one of the unique, yet simple points of difference. Promoted Pins are positioned naturally throughout a feed, amongst a cascade of other pins. 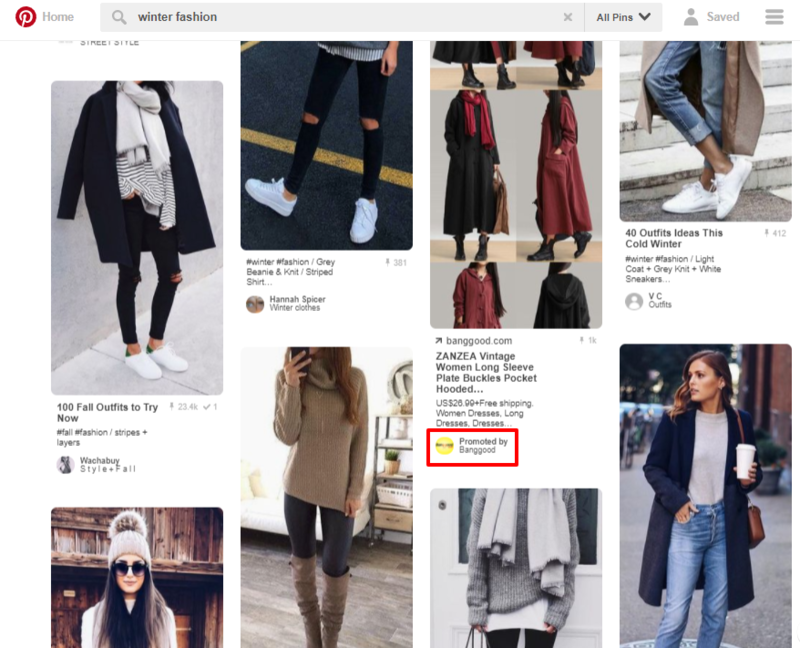 The folks over at Pinterest claim that by making Promoted Pins appear like all the rest, users won’t experience an interrupted session, nor will they get distracted by sponsored labels. Promoted pins do include the text “Promoted by” above the brand’s name, however, this is placed in a discreet, natural way. With a seamless, natural ad placement, the focus is removed from the advertiser and is entirely on the consumer, which makes for a more approachable discovery of products. If you’ve invested Facebook or Twitter ads in the past, you will know that the act of retweeting or sharing content is incredibly powerful in boosting the reach of your ads. 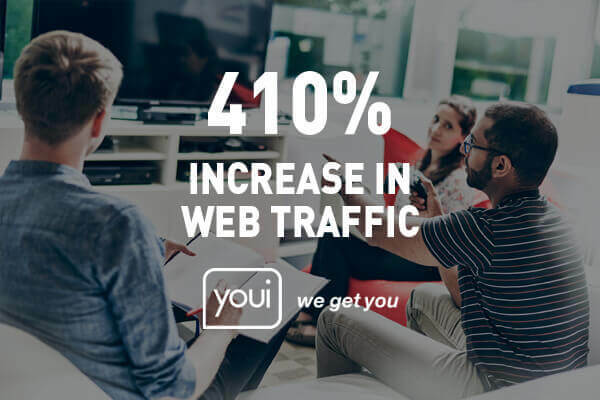 Not only does it provide your promotion more exposure, but this user-action also brings down costs associated with clicks and impressions, increasing the likelihood of a sales conversion. However, receiving earnt shares on the above-mentioned social platforms is not an easy feat due to the way in which content is consumed. Pinterest provides advertisers with a natural environment of content sharing. It is the core action taken on the platform, so it’s only natural that the Promoted Pins receive shares alongside user-generated pins. And even after your promotional campaign concludes, your content will continue to receive impressions from the “saves” (the process of re-pinning) which you would have generated during the promotion period. 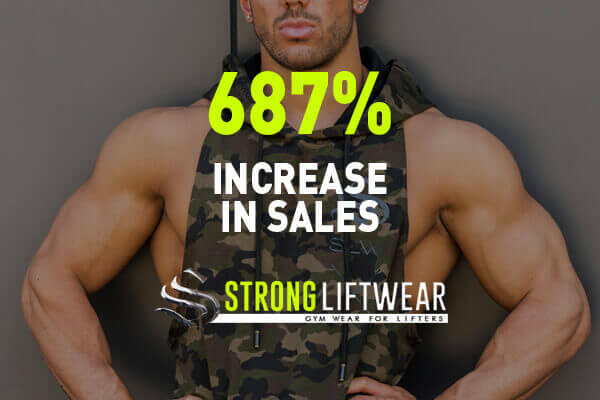 Ultimately, the promotion of your product pins is an effective means of increasing the presence of your products on user boards – increasing the likelihood of more sales and potential sales conversions in the future. This concept is unlike any other social platform, where posts are usually funnelled into a timeline’s archive and forgotten about, or removed entirely at the end of a campaign. 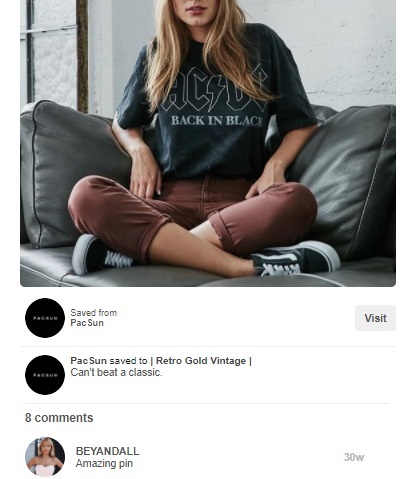 In the above example, Pacsun’s pin can be seen in circulation for over 30 weeks, proving continuous circulation – even after the initial promotion of the pin. Even once the product is no longer available, there remains the opportunity to redirect to the home or category page capturing the traffic with intent to buy. Pinterest states that of all referral traffic to websites, 5% comes from Pinterest. Impressively, Pinterest comes in second after Facebook, which drives almost 25% of all referral traffic online. In spite of Facebook’s strong hold on referral traffic market share, it’s important to highlight that the average order value (AOV) of a Pinterest shopper ($58.95) is higher than that of a Facebook shopper ($55). Pinterest also offers advertisers nifty targeting options for getting in front of their customers. Some of these targeting options include location, gender, language, and device. Moreover, you have freedom to strategically bid on keyword you know will be effective for appearing in front of your audience, according to your own Shopify data. Unfortunately, Pinterest also comes with a few limitations for brands looking to expand their business online. Pinterest ads are only compatible with only certain shopping sites such as Shopify and Demandware. Other shopping sites such as Joomla are not included in the Pinterest browse and buy trend, restricting many companies that are not working with specific shopping sites. Before investing too much time, make sure that your shopping site is compatible. Successful advertising on Pinterest ultimately relies on high quality imagery that captures users imagination and encourages saves or ‘pinning’. 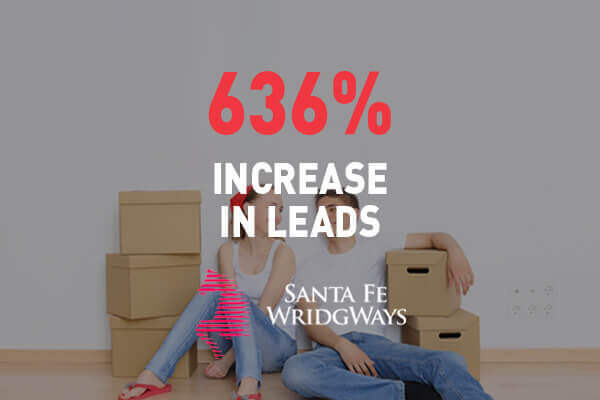 Planning a campaign that integrates with your overall digital strategy is the most effective way to drive sales conversions and achieve the best ROI. 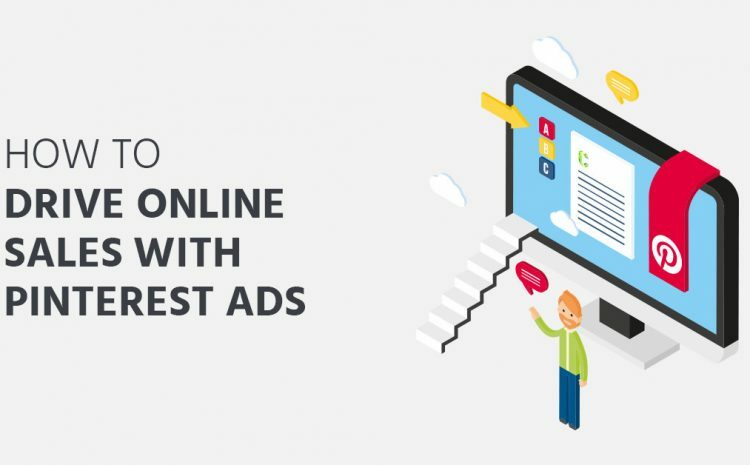 Combined with a strong content marketing and social media strategy, Pinterest advertising becomes a valuable option on an ideal platform. Have you considered how much more value you could add to your digital marketing campaign by having a cohesive channel strategy? Find out how you could achieve stronger sales growth and get clear insights by having a chat with one of our strategists.